Ploum Lodder Princen is a Rotterdam based law firm. They want to present themselves as: 'not you avarage law firm'. With the slogan 'We are significantly different' they are aiming to achieve results with practical solutions. The firm asked Redkiwi to design their corporate website with these characteristics in mind. The website will function as a place for future clients to get to know the company and for every other stakeholder to get the information they need. Just like the company, the website should be very practical. This is why Redkiwi designed and developed a responsive website. A website that is always attainable for people that need the quick contact information who are on their way to a meeting with Ploum Lodder Princen, as well as a platform for in-depth information that is easy to find. 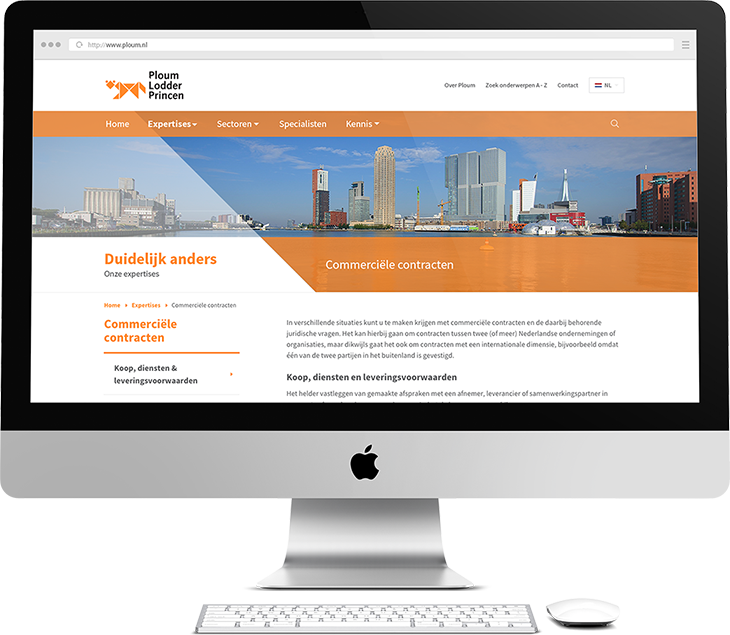 The design is based on content that was available in the existing Ploum Lodder Princen website. This content was very diverse so the in the design I made sure the client was able to make the design fit the content. Examples of elements that were designed to make common content pages as flexible as possible are: plain text, introductions, images, contact information, news items and headings. These were built into Visual Composer for WordPress, making sure the CMS was as flexible and accessible for the client as possible. Another wish from the client was that the website user would get the 'real' Ploum Lodder Princen feeling while visiting. The site incorporates a digital translation of the available offline identity. This resulted in a skewed line that is used in the logo and became a returning theme. Along with the identity color orange, making the site clean and recognizable for client and end-user. The design was made responsive to make sure every user gets an optimal view of the website. Since the amount of content on this website is very high, we had to make sure the design was still easy to navigate, even on the small screen of a smartphone. In consideration with the client we made sure the 'contact' information was always easily accessible, all elements were designed to work fluidly on every screen size. Do you have any questions about this project or are you interested to work with me? Please don't hesitate to send me a message.